iPhone - How to add people to on-going video chat in Facebook messenger? I'm using an iPhone 7 running iOS 12. 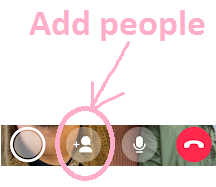 When I'm in an on-going video chat, I can't find the "add people" button to add more people to the on-going video chat. In Android I can see that button just fine, so I'm surprised that iOS doesn't have it. Do I need to activate it via settings or something? I got it. It's not the iPhone's fault, it's the fault of the other phone which uses Messenger Lite. Messenger Lite doesn't have conference call feature (at this moment). So if Messenger (full version) calls Messenger Lite, the "add people" button isn't available. So I install Messenger (full version) for the other phone and try calling again, and now I can see the "add people" button. Not the answer you're looking for? Browse other questions tagged ios facebook . How to disable iPhone notifications from Facebook Places? Does deleting a Facebook account in my iPhone Settings delete the actual Facebook account? Pages for iPhone: how to add a page break? How can I create shortcut for Facebook Messenger's contact?